Did you recently start a spray polyurethane foam (SPF) insulation business? If so, you likely travel from business to business and town to town, spraying commercial buildings, homes, or rooves. However, to many SPF contractors, it can quickly become a hassle to lug around all of the necessary spray foam insulation equipment, from job to job. Surely, there is a better way to manage this challenge: investing in a mobile spray rig. So what exactly is a spray insulation rig? More importantly, how can owning a spray foam rig enhance your business? 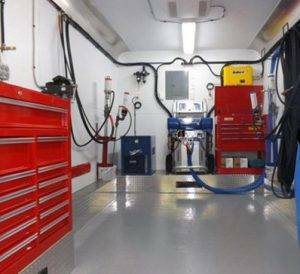 The best way to envision how a spray rig can help your business is to think of it as a portable garage where you can store your spray foam insulation machine, a generator, compressor, and much more. A spray rig can control the temperatures surrounding your chemical materials and can act as an ideal storage unit for maintaining your insulation products at optimal temperatures. For example, if the weather is cold, your rig can keep your spray chemicals at the right temperatures. Alternatively, if it is a hot day, the air conditioning will turn on and prevent your material from overheating and expanding. It can also maintain humidity levels. By controlling the temperature, you can store the materials at the manufacturer’s recommendations, leading to better control of the reaction between A and B materials, and yielding a better end product. At Intech Equipment & Supply, we believe it makes sense to invest in a spray foam rig. The extreme convenience of having your SPF equipment and materials stored in a single, accessible place. Job setup time is practically nonexistent. Thanks to your spray rig, you can be up and running right away, helping to improve your bottom line. There is no need to worry about rental equipment delays or spending hours searching for a power source. Many equipment providers and manufacturers design spray foam rigs to include work benches and other support tools, so you can service your SPF equipment and spray guns as needed. A foam spray rig can be your best source of marketing. In fact, it is quite common for contractors to install life-sized, colorful graphics along the sides of their mobile rigs, featuring the company name, logo, and contact information. While spray rigs for sale at other equipment providers may prove unreliable when it comes to repair and protection policies, if you purchase your spray rig from Intech Equipment & Supply, we always stand behind the products we sell and fix or replace your equipment right away. We also don’t lock you in to using a particular brand of spray foam. Intech Equipment & Supply features a wide range of styles of both standardized and customized new and used mobile spray rigs and trailers. Whether you are a commercial, residential, or roofing specialist, our team of professionals can custom-tailor to suit your needs. We custom-tailor our rigs and include fireproof insulation in the walls and ceiling, separate compartments for the generator and compressor, and a shore-powered heating package. Taking the time now to make an educated investment will most certainly pay off for your future business. For more information, or to order your spray foam rig, contact us today.